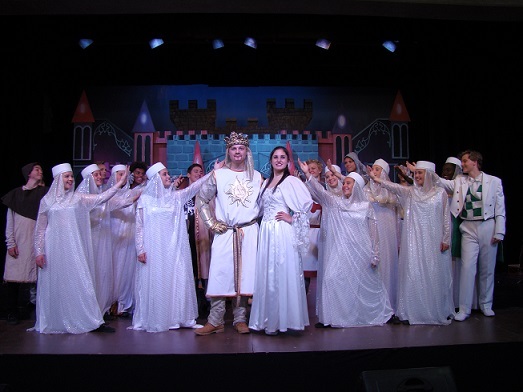 All kudos must go to the Northcliff High School’s production of Monty Python’s Spamalot, currently showing in the Playhouse Drama Theatre in Durban. Director Nick Jourdan has assembled a robust cast of students, all of whom attack the very humorous script with gusto, verve and an innate sense of professionalism, bringing to life the MP version of King Arthur’s quest for the Holy Grail. The programme notes describe the show as a “completely ridiculous cavalcade of nonsense, based on the film Monty Python and the Holy Grail” and this is exactly what it is - a frothy entertainment that keeps the audience in stitches. What makes the production all the more appealing is the fact that the movie first hit the big screen in 1975, many years before any of the cast were conceived, and the musical Spamalot opened on Broadway in 2005, when most of the actors were still running happily around on playgrounds. Fortunately, the humour has not dated and the cast probably have more fun with it than they used to in the aforementioned playgrounds! While all student productions should be viewed as ensemble pieces (in my humble opinion) there are several stand-out performances that demand special mention. Matthew Vey as King Arthur holds the entire production together with an exceptionally mature performance of a slightly confused and insecure King doing his level best to obey God’s word and find the Grail. His singing is outstanding, and he should go far if he continues life as an actor, as should the other stand-outs – Ross Anderson (Sir Galahad) who excels in Act One as a rather militant socialist before becoming a knight, Luke Wessels as Sir Robin, who shines in Act Two in the Broadway sequence, Tao Blignaut who brings an enchanting voice to her big production number, along with Tiana de Abreu (Guinevere), Declan McCullogh (Patsy, the coconut clopping squire) and Ntsika Kunene (Not Dead Fred). Mikaela de Ponte also delivers a five star performance as the Main French Taunter, and is ably supported by her other ensemble Taunters. There are also several outstanding moments that take pride of place in this rollicking romp, amongst them Arthur’s hysterical tap dance, the wooden rabbit, the taunting of the knights by the French, and the Black Knight sequence. I couldn’t quite decide if the Black Knight’s costume malfunction was planned or not, but either way, it was certainly one of the most hysterical highlights. But the entire production is full of moments that evoke spontaneous laughter from an appreciative audience. Add to this a superb orchestra under conductor Matthew Vlok, excellent sound and lighting, wonderful costumes and some rather innovative stage scenery and props, with bits of castle, forest etc flying in and out at a frantic pace, all ably handled by a hard-working backstage crew. While this is a production that can be enjoyed by the whole family, there are a couple of typically contentious Monty Pythonesque elements to it – the demographics of a Broadway production, Sir Lancelot (who likes to dance a lot) and the odd swearwords creeping in. The production is also rather long, and flags a bit in the Second Act once it moves away from the main characters, but these are minor points. Spamalot is truly well worth seeing, especially for those who “Always Look on the Bright Side of Life”!